BEST ANSWER: Thank you for your question. These glasses each hold 20 ounces. The reviews on these seem to be all over the place. Are they truly seemless and look like real glass or are they more plastic looking and feeling? BEST ANSWER: There is a VERY subtle smoothened seam area (more like a visual distortion than a hard-edged seam, and barely detectable) on one side of the bowl, but really compensated for by the extremely thin rim on the glass, very much like a handblown glass. Closer to the real thing than any I've ever seen, and well worth trying. Can't believe there are any plastic versions from other manufacturers that even come close, and I've looked just about everywhere. These glasses look great— many people, when they approach the table are surprised that they are not glass. They are clear and noon-reactive to wine. The only caution is that I'd recommend hand washing and be careful of superficial scratches. Otherwise, they're a very beautiful and practical alternative for outdoor use. The Indoor/Outdoor Cabernet/Merlot Wine Glasses (set of 4) are seamless plastic glasses made from food-safe, shatter-resistant Eastman Tritan™ copolyester (BPA-free/FDA-approved) which means they won't crack, break or lose their luster. They are thinner, more glass-like and perfect for entertaining. They are not as thin as a quality-glass wine glass, the rim is not an ideal thinness, for gourmet tasting. That said, they are quite nice and are thinner that most plastic of this size. And certainly great anywhere you might worry about broken glass. Perfect for hot tubs, pools and camping. They are definitely plastic, but much thinner and more glasslike than other plastic wine glasses I have purchased. I think the glasses look great! Are there 4 glasses per shipment? BEST ANSWER: Yes - there are 4 in a set. They look amazingly like real glass! Great investment for outdoor use without running the risk of breaking glass on the patio! Yes - and the recipient was very pleased with the quality of the glasses. Yes, four in a box. Sold is sets of 4. How tall are the wine glasses? BEST ANSWER: Ours are about 8 3/4 inches total; the stem is about 3 1/2 of that. We are very happy with them. And they are great for travel. The Indoor/Outdoor Cabernet/Merlot Wine Glasses (Set of 4) are 9 inches high and hold 20 ounces. They are just under 9'' tall . Great everyday glass. Manufacturer should be able to answer that question. BEST ANSWER: The diameter of the Cab/Merlot glasses are 3.25"
Can these glasses be monogrammed? Where are these wine glasses made? BEST ANSWER: Hello K, thank you for your question. The glasses are made overseas in Asia. My son gave me a set of the indoor/outdoor Cab stemware for Christmas and for plastic glasses, they were very nice - thin, nice rounded lip, smooth, and clear. It took a minute to realize they were plastic. I ordered a duplicate set (same upc) last month and they were much inferior. The plastic was thicker and less uniform. The lip was terrible - fatter, cut flat with two sharp edges on the inside and outside. I returned them. The PERFECT unbreakable wine glass! Product was backordered at first, but did arrive on the date promised. Glasses were packed very neatly and securely. I bought these for around the pool. They are a little light and as other reviewers have mentioned, slightly rough around the rim... Also, if you care, the plastic seam is visible. However, these are plastic glasses which completely serve their purpose. If breaking glass near the pool wasn't an issue, I would use a nice glass.... This is fine for its purpose.... I assume that if you are looking at purchasing plastic glasses, you would know that you are not going to fool guests into believing that they are glass! Looks like fine glass. Light and seamless. I bought these for the pool area. They are perfect! So much better than using a standard plastic cup. Very nice & durable. Great, sturdy product! Like Real Glass! Great product! It looks like real glass and is totally durable. Perfect for outdoor use. If you dine outside, this is good! They look good anywhere, but are practical and elegant for outside patio or pool side dining. These will help alleviate stress over breakage, but still give a polished appearance at the patio table. We purchased these glasses so that we could use them outside around the pool. They really look as good as my favorite inside glasses! The only criticism I would have is that the drinking edge is a little sharp. Drink Wine Outdoors? GET THESE! Whether you drink your wine indoors or out, these glasses will make you happy! And if you have slippery handed "party-foul" friends & family, like us, you'll save them the embarrassment of breaking your beloved wine glasses. They look so much like real glass; most everyone is fooled at first. I've tried many, many "unbreakable" glasses, and these are by far the best. I don't like putting them in the dishwasher, though, as they got "amber-colored" from the high heat, and will lose their "real glass" look. (So I just bought more!) They're so easy to wash by hand, anyway. Was looking for something to use while in the hot tub. These look like crystal but are unbreakable. I bought these for my husband at Christmas and he just loves them. We have a lanai with a pool and hot tub and he uses these frequently in the water without worry of breakage yet they are very elegant looking considering they are not glass. Highly recommended by us! Do not hesitate to buy. If they get knocked off a side table on the porch or by the pool there's no breakage. Spilled wine is a shame but no glass splinters is some consolation. Other plastic glasses I have tried for outdoor entertaining are either too flimsy or have such long stems they are not stable - a problem since they are not as heavy as glass. These lovely glasses look like real glass - even up close! VERY good quality. I bought them for a friends for use on his boat and they really look elegant and durable. Our guests were surprised and pleased with these plastic wine stemware 'glasses' and many asked where to buy this product. These glasses were mixed with glass but many preferred the plastic seeting on the patio and summer kitchen areas so not to be concerned with breakage. There were no complaints that the plastic was negatively impacting the taste of the wines served both reds and whites. Highly recommended!!! Great product and a good value. Calibrate your expectations; these are plastic wine glasses. They look good from even a few feet away, are comfortable to hold and drink from. I decided to try these because I've broken 7 of the "Break Resistant" crystal wine glasses sold here and elsewhere. Overall, I'm satisfied with these plastic wine glasses. Just what we'd hoped for at our mountain resort condo. No glass by pool, and unbreakable glasses at Crate & Barrel, etc., were clunky with thick-rimmed plastic glasses that were really lousy for nice wine. These are light, thin, unbreakable, crystal clear. Seams are visible, but so what--beats the alternative by a country mile. I am not a plastic person - otherwise I would have given these a 5 star. But for outdoor use, they really are 5 stars. I thought these would bear some resemblance to real crystal, beyond the shape. But I was wrong. They are much too light weight and have a cheap feel to them. I bought them for picnics, and will use them for such, but not with pleasure. They take your mind away from the wine you are drinking to the cheap glass you are drinking from. To add insult to injury, the other day I saw very similar, if not identical glasses at a major discount retailer for about $2.00 each. Was very unhappy with stemware we bought last year. I have much older polycarbonate glasses that still look good. Have had great luck dishwashing other product labeled polycarbonate in the past. These glasses look fantastic, but do not hold up. They start showing crack lines in the glasses just like acrylic does, very quickly. I asked, because I need replacements, and was told the manufacturer has not changed. this is a much lower quality product then what was carried by Wine Enthusiast last year. There are two visible seems down each side of the glass and the rim is thick. Can get the same quality product at a discount store. Last years product was so much better. It was almost difficult to tell last years product was plastic. This years product is very cheap looking/feeling. They look like glass wind glasses and the size is perfect for most wines! We use them when we have larger parties. We gave these to our son who lives in a neighborhood where having a glass of wine in the evening with other neighbors while watching kids in the evening is a routine. When he used these glasses all the rest of the neighbors wanted them too! These are nice polycarb glasses. You can't really tell they are plastic unless you pick one up. Much nicer than my prior outdoor wine glasses. After having a wine glass shatter while having dinner with my best friend and her 2 year old, I decided... what better gift? She is thrilled, obviously! We wanted glasses that look "real"
We use these on our yacht. Looks like fine glass ware but is safe if dropped onboard. We use the glasses around the pool and hot tub. These polycarbonate wine glasses are just what I was hoping for. 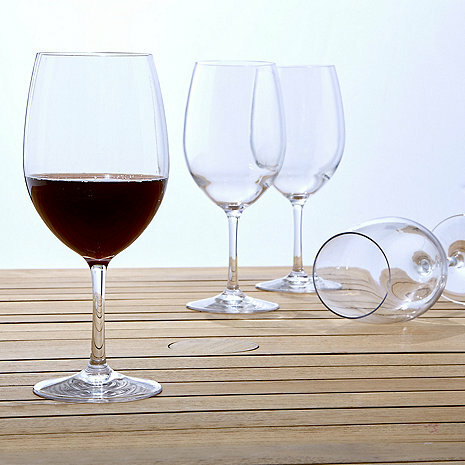 They resemble glass or crystal and the design is perfect for enjoying cabs and merlots. Now outdoor dining has more of a touch of elegance and the wine is enjoyed with no worries. Friends were impressed! I like much. Some sissy women complain about inner edge of rim rough. And thankfully these don't have beastly " Made in Taiwan " stamped in base ! We tested with friends and until we told them, they did not realize the glasses were not glass. Exceptional "real" feel and look. Came out of the dishwasher as clear and shiny as when new. They are lovely. Sure hope they are truly dishwasher safe over time. Great for outside entertaining or tailgating. Just great for outdoor use! I had an outdoor 4th of July party and wanted elegance without fear of breaking glass in an environment of dogs and children. The glasses looked amazing, my guests did not think they were unbreakable until I told them they were. Compared it to glasses purchased locally. Its clarity was far superior as was its construction. Held up well with dishwasher washing. Very confortable to use. Wine does not lose its arromatic and taste qualities. These wine glasses look like crystal and are great for the hot tub or patio. A Necessity if you drink wine outdoors! I love these glasses! They look like the real thing. No more shattered glasses - not to mention the hours involved cleaning up shattered shards of glass! A MUST if you entertain outside, on a boat, etc. These glasses are fantastic! My sister had been looking for unbreakable wine glasses for a long time to use on her patio when she has cookouts & gatherings. She kept complaining that all she could find were cheap looking plastic glasses that were colored, or were super thick plastic. I knew exactly where to look...Wine Enthusiast to the rescue! I sent her 4 Chardonnay and 4 Merlot for Mothers Day and she was thrilled! I just went to visit and had a chance to use them and they are gorgeous! They look like real wine glasses! They are dishwasher safe and can take a beating! These are a great addition for anybody who enjoys entertaining outside. You can also get them monogrammed! Perfect styling and thin. Great product. Finally we have outdoor wine glasses that we can feel good about. I looked everywhere for thin non-breakable wine glasses to use on my patio. THese look great! I purchased these for our impromptu picnics at local outdoor music festivals. They are exactly what I was looking for! They are lightweight, elegant, and perfect for red wine. We are very glad to own them. No negative comments, they travel great allowing us to enjoy wine in style while others are drinking from plastic motel cups.